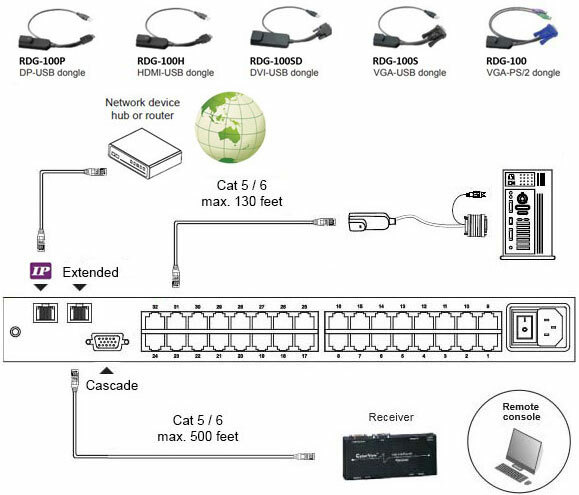 Raloy RD119 rack console with CATx KVM features a 19" TFT LCD and an integrated single or multi user Over-IP KVM switch. The RD119 is the ultimate rackmount keyboard/monitor solution, providing a keyboard and mouse console, an independently accessible LCD panel and a KVM Switch into a single unit taking up only 1U (1.73 in.) of server rack space. Raloy IP KVMs are offered in 2 styles: High Density CATx or Basic DB-15. RD119-CATx Rear & Extended Application. RD119-KVM (DB-15) Rear & Extended Application.